Having had very fine and stubborn hair since my early teenage years, I have tried every trick in the book for "coping" with thin hair. What I found to make the most difference, however, is investing in high-quality hair care products developed specifically for your hair type. Between shoulder-length layered haircuts, root lifters, and even hair extensions, I think there is very little I haven't tried in my pursuit for thicker hair without compromising on shine. From experience, I cannot emphasize enough the importance of targeted hair care. In light of this, I recently had the opportunity to try the one-of-a-kind Nanogen range, including their thickening shampoo and conditioner treatment, and a root boost spray. This range was designed especially for women (worry not gentlemen, they have an entire product line just for you as well), promising added thickness, volume, and shine with every product. Their formula incorporates everyone's favorite, hyaluronic acid, and peptides (amino acid bonds) alongside the well-known ingredients of Aloe and Chamomile. If you are already being treated for hair loss, then you will be delighted to know that both the shampoo and the conditioner are suitable for Minoxidil users. I have been told by my hairdresser that your hair should not feel soft after shampooing, but I have never actually experienced this before Nanogen. Even before leaving the shower, I can tell that my hair feels thicker and stronger. The conditioner then helps soften the texture out a little and gives an extra volume boost when raked through the hair. Post-wash, the root boost spray will help achieve extra bounce while styling. I don't typically use a lot of styling products, so I have been quite conservative in the use of the spray. Nonetheless, I can immediately tell that my roots are standing stronger than before immediately after a blow dry. However, I am still having issues getting the effect to last throughout the day. 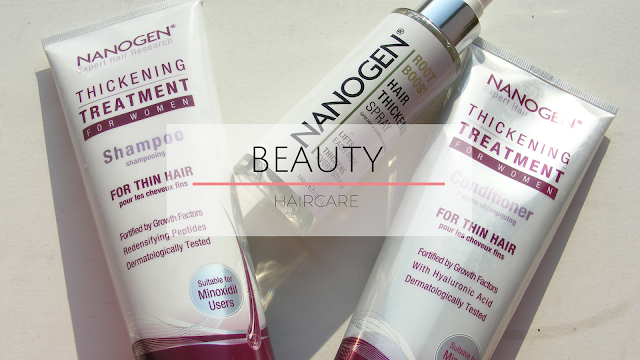 Lastly, if you are interested in hair thickening products such as Nanogen, please, please do a quick patch test before jumping into the treatment. I'm not entirely sure this is recommended by the brand, but I had to learn it the hard way - the first time I used the products, I ended up with an extremely itchy scalp overnight. After taking a short break from Nanogen and returning to my regular routine for a bit, I was then able and prepared to ease myself into the treatment, with which I could not be happier now. Sounds interesting. I use Roots from Lush, I've found that's seriously boosted my hair. I used to have really thin hair, but pregnancy seems to have totally sorted that out.